No one likes a little showoff... oh who are we kidding - EVERYONE loves this little showoff. 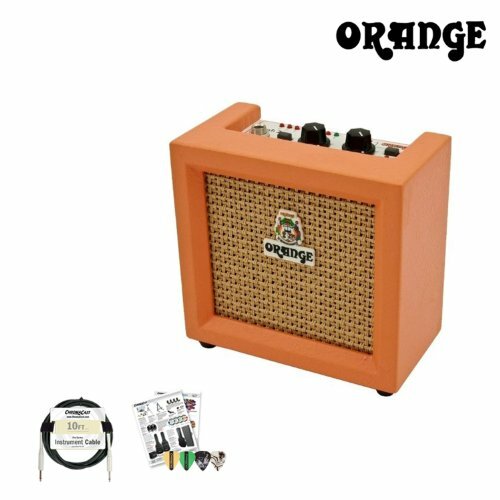 Check out the Orange CR3 mini combo amp. Smaller than a bag of actual oranges, this little amp's got way-huge tone. Just pop in a 9V and you're good to go. Pushing a 4" speaker with a mere three watts, the sound of the CR3 is still 100% Orange all the way. And unlike other so-called mini amps, the CR3's got a full set of controls, including volume, tone, and overdrive. There's even a tuner and a headphone output on the CR3. And to top it all off, the CR3 is made of the same wood, covered in the same surfacing, and features the same grille cloth found on most Orange amps. How cool is that!? Includes: 4 Pick Sampler and 10 Foot Cable. If you have any questions about this product by GoDpsMusic, contact us by completing and submitting the form below. If you are looking for a specif part number, please include it with your message.